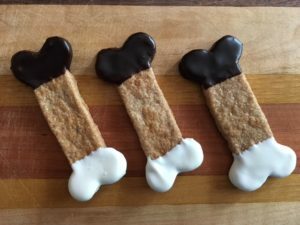 Carrie’s treats are adorable and shaped like bones, paws, or seasonal items. She offers shamrocks for St Patrick’s Day, pumpkins for Halloween and stars for Christmas. 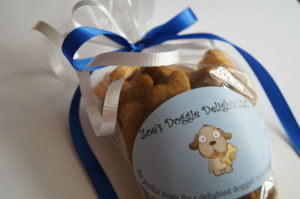 Her treats have names like, Zoe’s Veggie Bites, Bow Wow Bars and Cream Cheese Woofies. 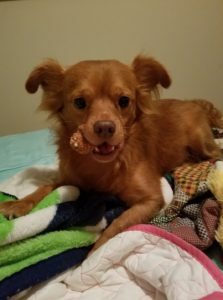 She offers packages like the Itty Bitty Paw Pack and Bucket of Bones. 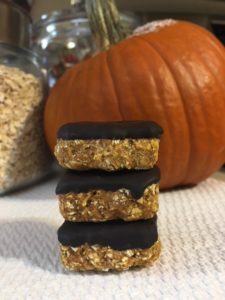 Flavors are things like Cheddar Chomps and Veggie Bites. 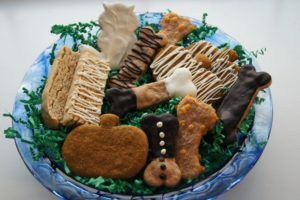 The treats are made with wholesome human grade ingredients that dogs love, like sweet potatoes, nuts, cheeses, bananas, pumpkins, eggs, applesauce, carrots and parsley. 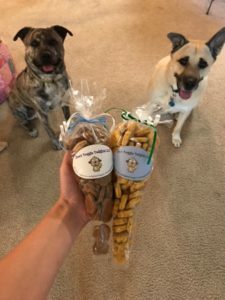 Carrie says, “If you want to taste test what you dog is eating, you can go ahead and try them too.” There are no added preservatives, chemicals, or colors. 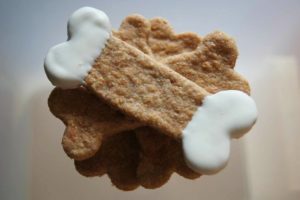 Carrie will also bake custom orders, like wheat free treats, to suit your dog’s needs. 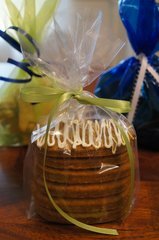 And you can have the biscuits customized with your dog’s name. How cute is that?! In her first year in Ohio, Carrie designed her web site herself on Go Daddy. 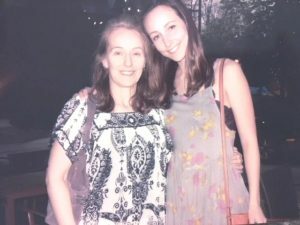 “My daughter Haley, helps me with social media and is a great sounding board for ideas.” Carrie is working to get the word out through Instagram and Facebook. She also attends craft shows and dog events where she sets up a booth with her treats. Right now Carrie bakes everything at home in her own kitchen. She has many family doggie taste testers. “They are the lucky dogs who get to sample my creations.” She needed a permit from the Department of Agriculture since she was making things that animals would eat, funny right? 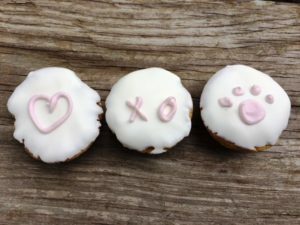 “As I grow, I’d like to find a commercial kitchen that I can share with another baker.” These make perfect gifts for new puppies, holiday gifts and doggie birthdays and are great for everyday healthy snacking. Take a chance on a new business venture when you make a move.